Mike J. Nelson, Bill Corbett, and Kevin Murphy – the RiffTrax crew – are gods among men. “Mystery Science Theater 3000” is entirely responsible for kick-starting my movie obsession as a youth. The Incredible Melting Man! “Atcha!” Eegah! “Stem-lo” Pod People “Trumpy, you can do stupid things!” As I know from growing up in the Twin Cities myself, the local impact of the show was unprecedented and is, somehow uniquely and indescribably Minnesotan. 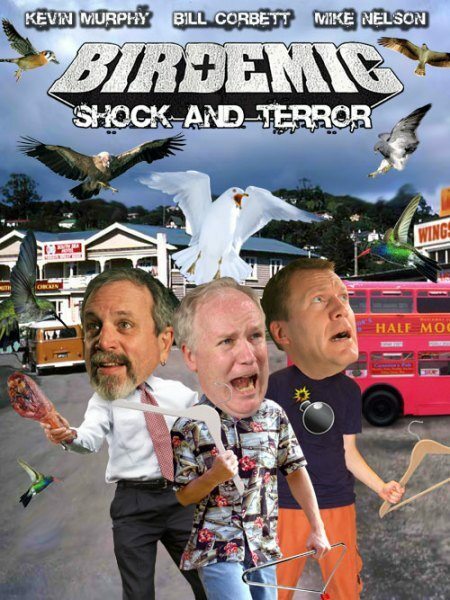 It is of the highest honor that Mike and the gang will be riffing a project so close to my heart – Birdemic: Shock And Terror. I haven’t had the chance to listen to it yet (currently downloading), but if you’d like a head-start, all you have to do is purchase their commentary MP3 via the RiffTrax website and sync it up with your Birdemic DVD or Blu-ray purchased from your local video store (Best Buy and Amazon are known carriers), or snag it on Time Warner OnDemand. Enjoy!